18" to 58" in Length. 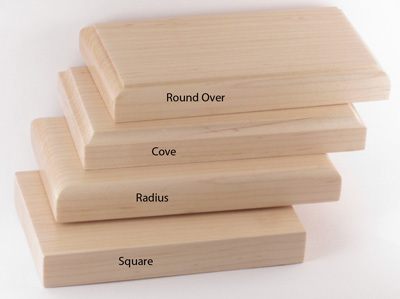 Select the traditional 3.5" wide or an impressive 4.5" Extra Wide Shaker Peg Rack. 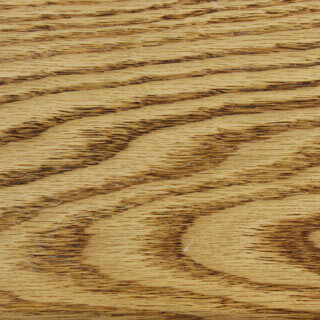 Created from hand selected 3/4" thick Solid Oak. Nine specially selected standard colors. Optional "Extra Wide" 4.5 inch for making an impressive statement. 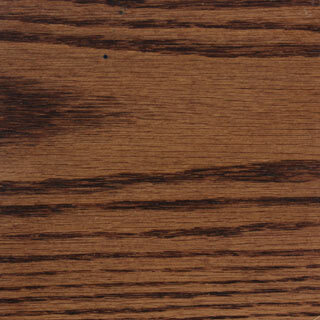 Or standard 3.5" wide. Six popular lengths to choose from. 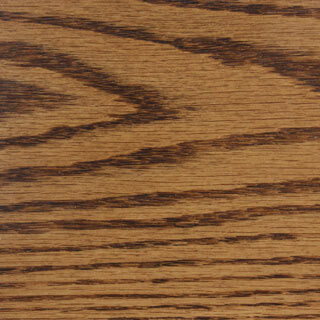 Four distinctive edge profiles are available. Stains, Finishes, and shipping boxes all Made In The USA. 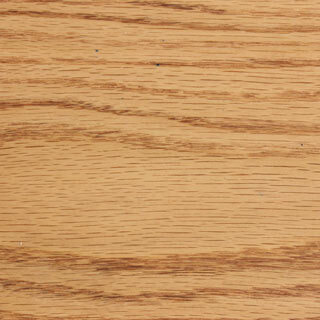 Matching Solid Oak pegs are 3" long and evenly spaced every 6". All top coated with a hand rubbed clear satin finish. Two mounting options, a hidden "key hole" in back or a through hole with an Oak "button plug" cover. Mounting holes spaced symmetrically, 16" on center for easy stud mounting. Got exactly what we ordered. Beautiful piece of work. Matches our cabinets perfectly. It was beautiful!! Love it!! 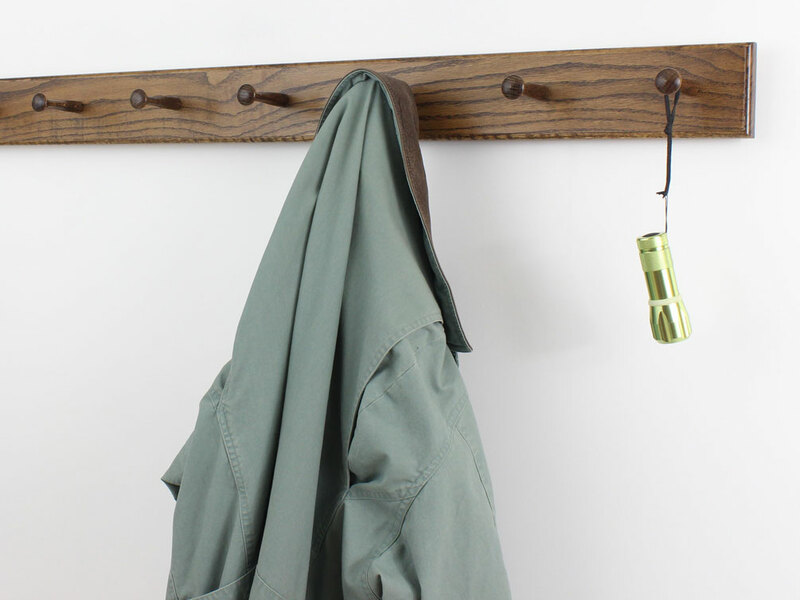 The shaker peg rack is just what I had been searching for to hang jackets, coats, and scarves at an entry door. 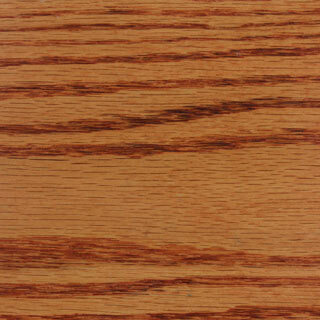 Quality workmanship; handmade in the USA; fair pricing; quick delivery; easy to install. Love it! 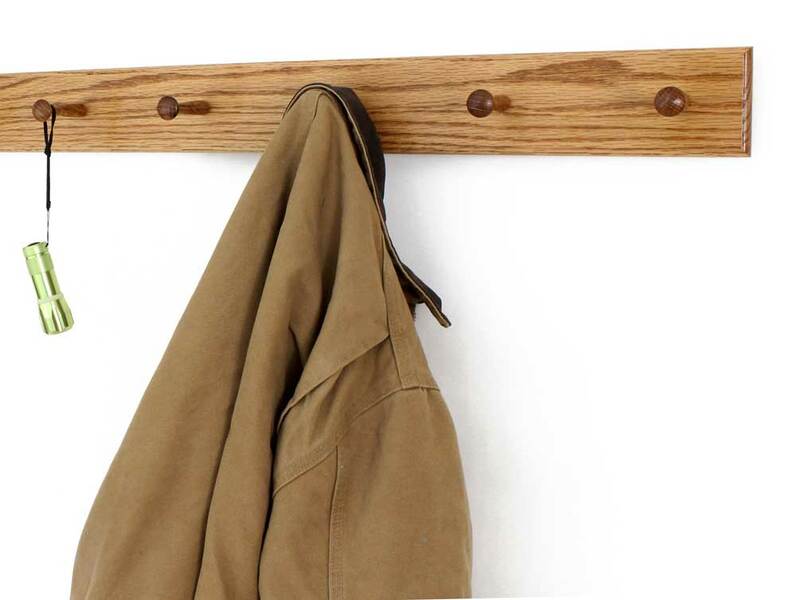 I ordered a 6 foot 10 peg coat rack from Ed without even needing to talk with him. His drawings are so detailed, his instructions so easy that i was able to give him my specifications in the original order. He expressed some concern over one of my requirements and was on the phone explaining to me why I should modify this specification, which made sense, resulting in implementing his change. Amazing service! I ordered this piece on a Thursday and had it on my front porch the following Wednesday. I was expecting at least 2-3 weeks passing before I'd receive it. The finish work was superb. If I need millwork again, I'll never go anywhere else. Excellent high quality product. Although not inexpensive the products are very good value for the price. While the products are of superlative quality the brief instructions and suggestions are of the same ilk! Thank you Peg and Rail. 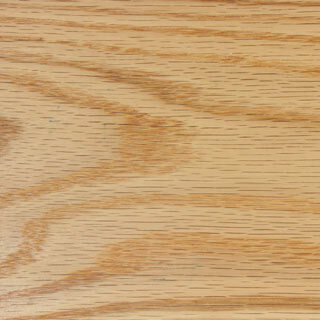 Ordered a 6-peg natural oak rail. Arrived 6 days after the order was placed online. Arrived well wrapped and boxed. Pleased with the quality of the product and with the service. It is up and holding all our walking sticks. Title says it all. Very nicely done. Reasonable price for quality. Must have gone quickly into production pipeline as it was made and received half-way across country in a week. Thanks... glad we found your site! Very nice product. Overall good experience. These are quality products. The website is so good that you can specify exactly what you want and that's what you get and they arrive promptly. The finish is perfect and I am proud to have them in my home. 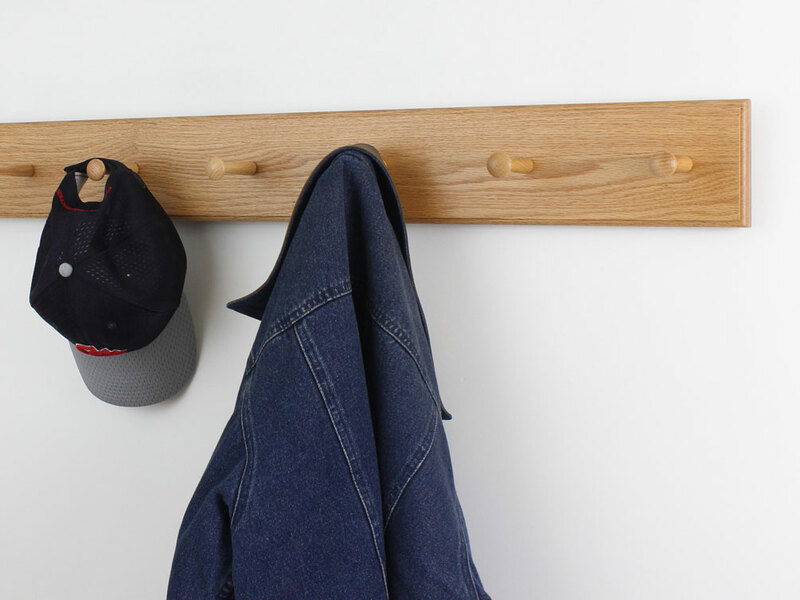 My third coat rack in the last 10 years and once again, quality, quality, quality. I purchased the keyhole mounting option and installation was quick and easy. It was perfect! Just as I had imagined! Loved being able to customize length & number of pegs. I like the peg rack very much. Thanks! First rate fit and finish. Made in USA! 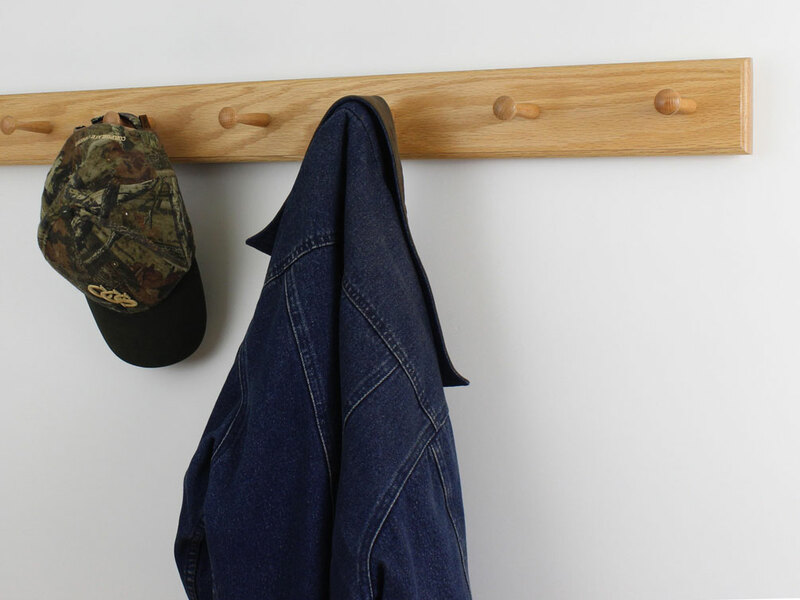 We recently moved into a new home and we needed a rack to hang our winter jackets on. 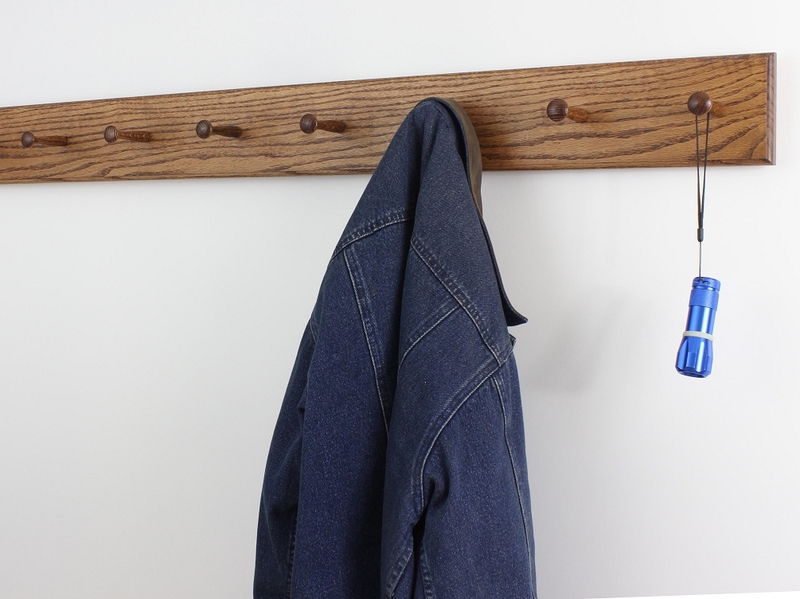 We love the Oak Shaker Peg Rack we ordered from Peg and Rail. It's well made and exactly the quality we hoped it would be. When initially searching online, as soon as I found the Peg and Rail website I knew that that was where I wanted to shop. 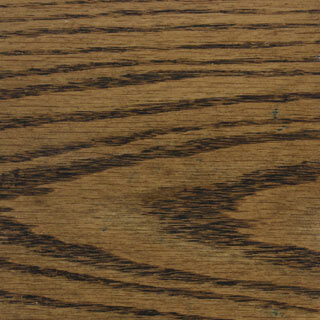 The company's integrity and dedication to craftsmanship comes through on their website. Thank you so much! The peg rails are perfect. Fingers crossed that my farm stand does well this season and I will put in another order! We were extremely pleased with all 3 of the clothes racks. Shipment was prompt. 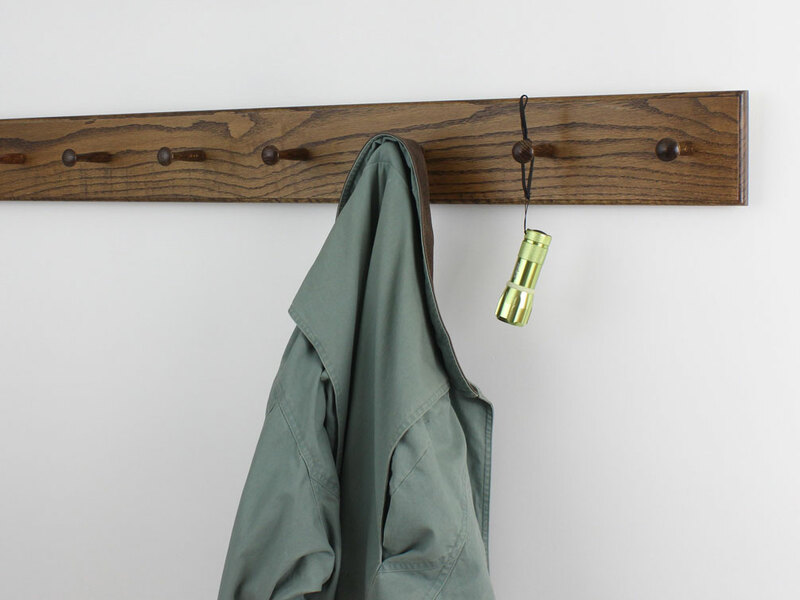 Would recommend to anyone looking for some beautiful handcrafted wall mounted clothing/coat racks! No problem I can make the up to 96 inches without a problem. Sorry for the inconvenience! I appreciate you bringing that to my attention. I have fixed that you should now be able to select "Button Plug" as an option. The weather forecast tells you that it looks like rain today. The last thing you want is to spend your early morning hours searching out a raincoat or umbrella. 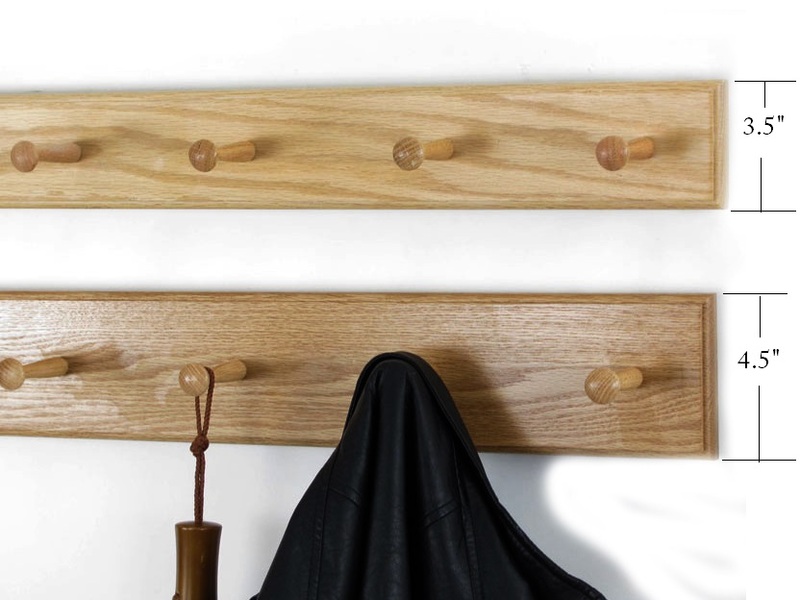 You will never have this problem again with the Oak Shaker Peg Racks, available in nine stylish colors. 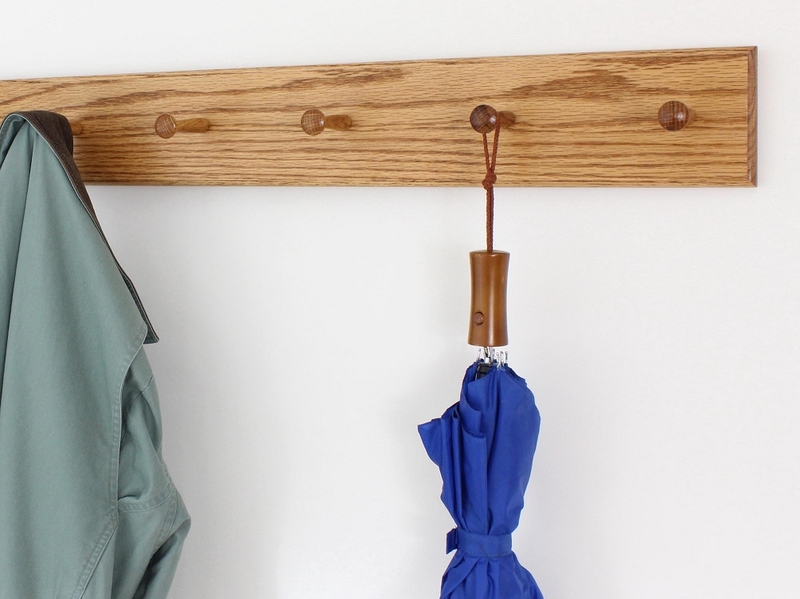 With this lovely wood peg rack, your favorite Audrey Hepburn style raincoat will be waiting whenever you need it. 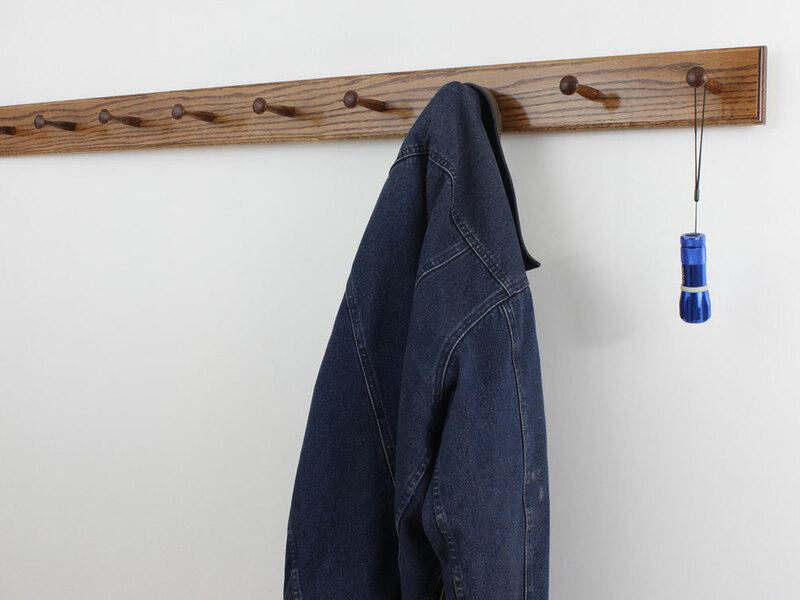 Hang your umbrellas, wool pea coats, and much more within easy reach. 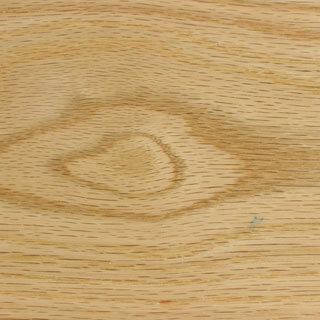 This piece is made from solid oak with a distinctive edge profile and careful attention to detail. It will look at home with any decor and in any space. The best part? It can be designed to your. That way, you can accommodate all of your coats, hats, and umbrellas and you might even have room for your family’s outerwear as well.